While Thomas Vinterberg's The Commune failed to inspire the way acclaimed films The Hunt and The Celebration did, he's a director who stays at a ridiculously high level no matter what. The Dogme 95 founder, who briefly went semi-mainstream with the underrated Far from the Madding Crowd, is back on the fall festival circuit with the submarine thriller, Kursk, and a new trailer for it has debuted prior to its world premiere in Toronto. Kursk is based on a real life tragedy, the 2000 Kursk submarine disaster that saw 118 Russian sailors killed, while two dozen were left alive to wait for help as their air dwindled by the minute. The cast for this is phenomenal, led by Colin Firth, Matthias Schoenaerts, Lea Seydoux, Max von Sydow, and the late Michael Nyqvist in his final screen role. Here's the synopsis: It is the first major Russian Navy exercise since the end of the Soviet Union, but the K-141 Kursk is deemed unsinkable and its crew recognized as the best in the Northern Fleet. 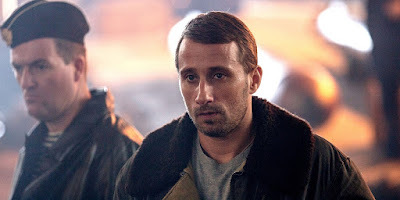 Among the crew is Captain-Lieutenant Mikhail Kalekov (Schoenaerts), a devoted naval officer with a loving wife (Seydoux), and child, and another on the way. He and his crew board the Kursk and descend into the Barents Sea with a sense of optimism and fraternity. Then come the explosions…Once the sub’s seismic activity is detected, Britain, France, and Norway offer their assistance, but Russia insists it has the situation under control. Time is of the essence, but time keeps passing. Kursk hits theaters overseas in November, and a stateside date should soon follow.